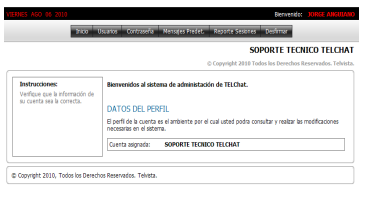 TELChat is the best way to contact with the people that are important to you. Give personal attention in real time. Change the status of your conversation giving right click. Redirect your client to other agent. 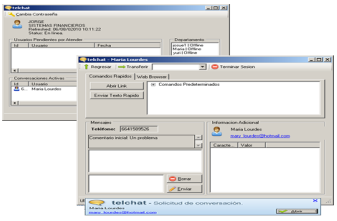 TELChat offer to you a lot of posibilities to make easy the link client – worker. You can have multi sessions online, meet when the client is typing, also when they have concluded the session. You can have the agent control, admin their accounts and viewer the sessions reports and the duration time of this sessions in a range of time. You will have a Windows application where the agents can admin the sessions and give attention to client requests. A message box will be show when a client start a session and this could be attended by any of our agents. Your clients could contact in their navigator with any of our agents with the propose to have attention, resolve some questions, have information or wherever they need about or business. 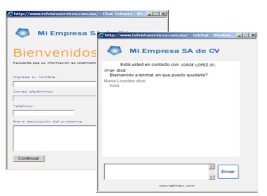 Consists of a web application that enables you to carry the control of users that will support your customers. Set default message to display to your customers. Manage user passwords. If you want a report on the number of sessions carried out also has a detailed report by user the number of sessions conducted and the time in seconds of each.